Though eating take-away foods is not a big part of Venetian food culture, there are moments during your travels when both time and budget constraints will make you want a quick, handy and affordable meal. When, for example, you plan to spend an afternoon at the beach it is completely normal to pack portable food. As with all other food in Venice, the trick here is to seek out snacks and takeaway foods that really are fresh and affordable and to stick to eating local specialties. Grabbing a few tramazzini - sandwiches on soft white bread - or a slice of ricotta and spinach tart are a couple of excellent options when it comes to picking up some authentic fast food in Venice. Cip Ciap, 5799/A Castello, On Calle Mondo, Near Campo Santa Maria Formosa. Cip CIap is the place to go if you're not in the mood for a restaurant but still want a special take-away lunch. This shop specializes in fresh pizza on foccacia and savory rustic tortes. The ricotta spinach torte is amazing! The smaller tortes are sold as individual units, everything else is sold by the piece in units of 100 grams or more. You can specify how large of a piece you would like and whether or not you would like it heated. If you have any trouble finding this place, look for the shop with groups of school children pressing their faces to the windows. Bar Rialto, 234 San Polo, on Ruga dei Spezieri, Near Rialto Market. The "Bar Rialto" in a shiny new location is still a great snack-stop specializing in coffee, drinks, and, most notably, "tramezzini." Tramezzini are sandwiches made on soft, thinly sliced and crustless white bread stuffed with regional foods like bresaola, prosciutto and vegetables. They all cost less than 2 euros! Tip: They make the tramezzini in the morning. So, if you prefer a savory breakfast over pastries go in the morning and grab a proscuitto e uova tramezzino. That's what I do! Fuori Menu by Le Cafe, 2769 San Marco, On Calle Spezier Near Campo Santo Stefano. A newer spot by the owners of Le Cafe, Fuori Menu is a take-out only bakery popular with Venetian locals and tourists alike. Focusing on baked goods and fast meals, Fuori menu offers pastries, breads, pizzas and also salads, fruit salads and smoothies. Despite it's bright and modern decor, the prices here are more than reasonable and quality is excellent. Learn more on their website. Frulala, Cannaregio District on the Strada Nova and Near Rialto. Cocktail bars by night but juice bars by day! 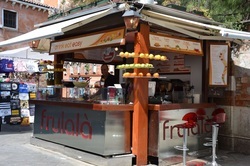 The Frulala stands are great places to stop bye for a healthy snack on the run in Venice. They make fresh smoothies, fruit salads, and wonderful yogurt and granola snacks. You can sit near the stand or take your snack with you as you continue to explore the city. You can visit their website here. Rizzo Lido, Gran Viale Santa Maria Elizabetta. 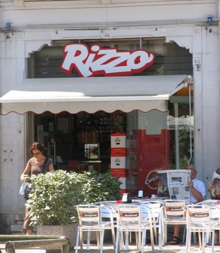 Rizzo is an essential stop on the Lido if you're thinking of having a picnic on the beach. They have a supply of pizzas, desserts, snacks and prepared foods all of which is available to take-away. They've also got a cafe and some outdoor seating where you can relax with a coffee and pastry. Rizzo also caters large events. Learn more on their website. Ala Bragora 3604 Castello, On Salizada San Antonin, Near Bragora. 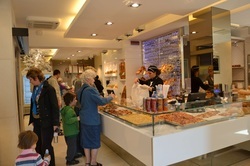 Just a few minutes walk from the expensive cafes on the Riva Schiavoni, and near the excellent local artisan shopping on Salizada San Antonin and Salizada Dei Grecci, Ala Bragora is a wonderful pasticceria and a fantastic place to stop into for a quick snack or lunch while touring between San Marco and the Arsenale. Have an almond biscotto. You won't be disappointed.